Brody is an artist, but he’s no longer starving, though once he might have been when he was a stray dog on a downward spiral. His life changed when Manatee Animal Services in Palmetto, FL, picked him up and turned him over to Skyway Border Collie Rescue. They posted his photo and description on Petfinder, where Lisa Morrissey of Hudson, FL, first saw him. “He had this little tilt in his head, his ears were perked up, and I thought he looked like the coolest dog in the world,” she told Cynthia Smoot in an interview on Fox13 News Tampa Bay. 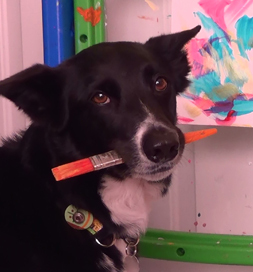 Brody prepares to work on a painting. Lisa adopted him and knew right away she had to build up the timid dog’s confidence. She set out to do that, using positive reinforcement to teach him over 200 tricks. The work also channeled the Border Collie‘s incredible energy, some of which he uses up by walking on a tread mill for at least 45 minutes each day. He does require a little assistance: Lisa loads the brush with paint. He then takes it between his jaws. She encourages with “Brush, brush,” and the artist begins his work. His paintings are abstract — but then so were Jackson Pollack’s. Lisa says he’s “pawing” forward his good fortune at finding a home by producing pictures that can be auctioned or raffled off at fundraisers for animal welfare and other charitable organizations. Some have brought more than $100. Brody inspired Lisa to get her trick dog instructor certification, and together, they have embarked on an adventure — just showing that when you adopt, you never know what’s around the corner.